If you’ve seen the movie Trick ‘r Treat, the name Michael Dougherty probably rings a bell. That movie has gathered such a cult like following that it’s made the director pretty popular. While a sequel to that film is still very anticipated, the director has decided to switch seasons for his next movie: Krampus. Based on the mythical creature of the same name. The story follows Max. A young boy who just wants to have a great Christmas. Although he knows Santa Clause isn’t real, he still believes in the spirit of the holidays and what they mean. Unfortunately, no one around him feels the same. As the fighting and taunting grows, Max finally flips out and snaps on all his family members. Declaring how much he hates Christmas and tears up and throws away his letter to Santa Claus. Upon doing so, he unknowingly summons the evil spirit of Krampus. Once he appears, the body count quickly rises. From the trailers, one might assume this is a straight horror movie. In all actuality, its more of a fantasy/comedy. David Koechner brings his comedic timing to the forefront, playing the in-law from hell to Adam Scott’s typical overworked family man. Two and a Half Men‘s Conchata Ferrell is also great as the drunk aunt who is critical of everything and everyone. Toni Collette (Little Miss Sunshine) & Alison Tolman (FX’s Fargo) play sisters who are night and day personality wise. With Tolman’s Linda being the thorn in her sister’s side. The movie has some great visual effects. The monsters that attack the family are all holiday themed. So some of them have a sense of humor to them. Specifically, the gingerbread men that attack Koechner’s character in the kitchen. Krampus himself is depicted almost as he is in most stories. We only get a few good long looks at him. But they’re enough to get their point across and showcase the demon properly. Krampus was a lot of fun. 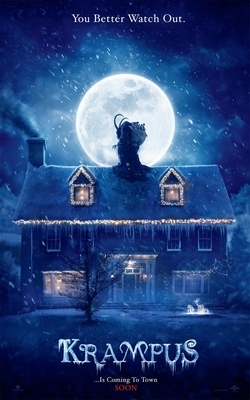 Its always great to see a different type of Christmas movie, and Krampus is nothing like what will be on television on December 25th. Although I predicted the ending about midway through, its still a very satisfying ending and the film itself is executed very well. If your kids are a little old for The Grinch and Miracle on 34th Street, this is a good movie to see during the holidays.